Percy was born in the December quarter 1893, the son of Joseph (Platelayer) and Esther Mary (née Litchfield) Wood of South Street, Riddings, Derbyshire. Percy had a younger sister, Ethel, (1901 Census RG 13/3233). Percy's Service Papers have not survived and his Medal Index Card indicates that he was posted to France with his Battalion after the end of 1915, as he was not eligible for 1915 Star Medal. He enlisted at Buxton into the 58th Field Ambulance, Royal Army Medical Corps which was attached to the 19th (Western) Division. 'The Buxton Advertiser' (13th April 1918) said that: "Our fallen friend joined up soon after the outbreak and had 3½ years in France with the Field Ambulance". However, this would suggest he was posted to France within a month of the outbreak - which seems unlikely without adequate training. 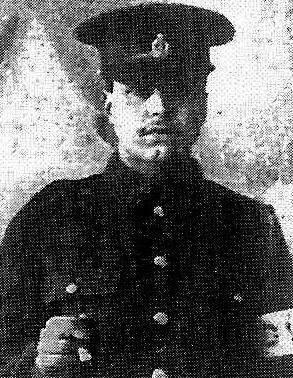 His RAMC armband is just visible on his left arm in his photo shown above right. The 19th (Western) Division was established by the Western Command in September 1914, as part of the Army Orders authorising Kitchener's Second New Army, K2. The units of the Division initially concentrated in the Bulford area with the infantry being at Tidworth, Ludgershall and Grately. The battalions moved into billets for the winter, in Andover, Whitchurch, Basingstoke and Weston-super-Mare. In March 1915 all units concentrated near Tidworth.. The Division was inspected by King George V on the 23rd June 1915 and advanced parties left for France on the 11th July, with the main body crossing the Channel between the 16th - 21st July. Units initially moved to the point of assembly near St Omer. It would seem, therefore that maybe the 'Advertiser' should have read '2½ years'. Other R.A.M.C. men with similar Service Numbers were posted in September/October 1915. In 1916, during The Battle of the Somme, which began on the 1st July, the Division were in action at The Battle of Albert, 1st - 13th July, in which it captured La Boisselle; The Battle of High Wood, 14th July - 15th September; The Battle of Pozières Ridge , 23rd July - 3rd September; The Battle of the Ancre Heights, 1st October - 11th November, and The Battle of the Ancre, 13th - 18th November. The following year the Division fought at The Battle of Messines, 7th - 14th June 1917, and several phases of The Third Battle of Ypres, (31st July - 10th November 1917). These included The Battle of the Menin Road Ridge, 20th - 25th September; The Battle of Polygon Wood, 26th September - 3rd October: The Battle of Broodseinde, 4th October 1917; The Battle of Poelcappelle, 9th October 1917; The First Battle of Passchendaele, 12th October, and The Second Battle of Passchendaele, 26th October - 10th November. Percy must have had some leave, however, as he married Nellie in October 1917 in Buxton. The first major action of 1918 was 'Kaiserschlacht' - the first day of the German Spring Offensive: 21st March, which marked the opening of The Battle of St Quentin, 21st - 23rd March, immediately followed by The First Battle of Bapaume, 24th - 25th March . The second day of this Battle also marked the day that Percy was killed in action. I take it you have already heard officially from the War Office but I wished to express to you my deepest sympathy and that of all his comrades in the ambulance. He was killed instantaneously by a shell while carrying wounded through a heavy barrage. You will, at least, have the satisfaction of knowing that he died as a brave man should." One of Percy's friends, Pte. Jumelville, also wrote to his wife, saying, in part: "Percy and I were the greatest of friends until the hour of his death. He was greatly liked by all in the ambulance, and his death is a big blow to all of us, as he was ever ready to render his services to help his fellow-comrades. ..... Percy died a hero's death, taking his part for the cause of his Country, for the triumph of right over might." According to the CWGC Records, Percy was the only member of the 58th Field Ambulance team to be killed on the 25th March 1918. 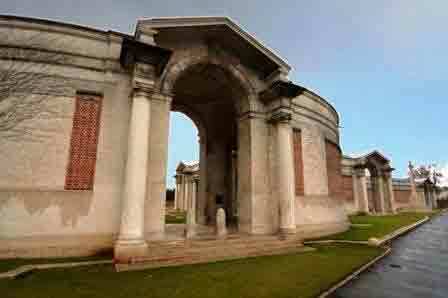 He may have been buried near to where he fell, but now has no known grave and is commemorated on the Arras Memorial. He died of wounds on the 7th June 1918 and is buried at Sezanne Communal Cemetery. · "RAMC in The Great War"